Blue Diamond Almonds has three campuses in Northern California – located in the cities of Sacramento, Salida and Turlock – which collectively employ more than 1,000 people. Each campus offers a healthy work environment in an attractive, vital community. 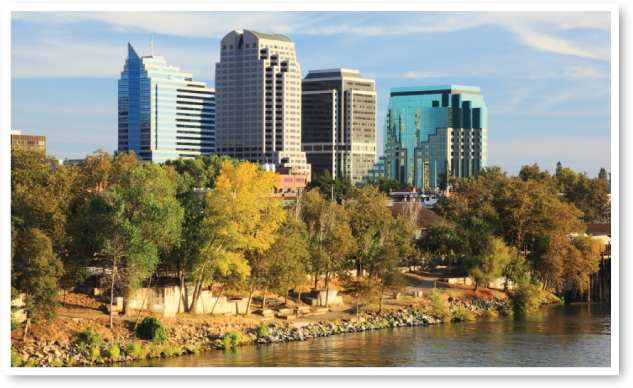 River edge view of the Sacramento skyline. California’s capital city is home base for our historic headquarters, founded on this site in 1910. A 1995 assessment confirmed this as the best location to continue the heart of our operations, and we launched a ten-year, $30-million plant improvement program. We created a secure, enclosed, gated campus and state-of-the-art technologies to process our almonds for worldwide distribution. It includes our administrative offices, our Almond Innovation Center, almond processing, shipping, and receiving. In 2013 we opened our 6,500-square-foot Almond Innovation Center – a research center dedicated to designing and developing new almond products. It is here where our food scientists, regulatory staff, and others advance the work that makes Blue Diamond Growers the world’s leading almond co-op. Sacramento ranks 17th on the Glassdoor Employment Satisfaction Report Card which looks into what it’s like to work in 50 of the largest US metros. 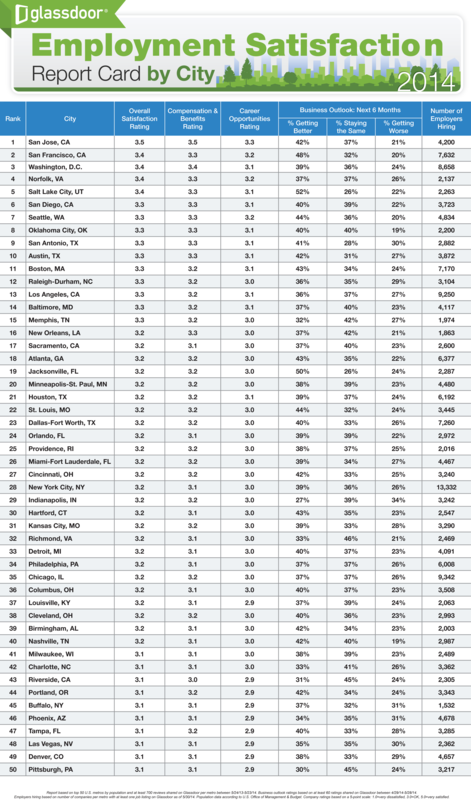 This report offers a comparison of overall employment satisfaction by city, goes in-depth to compare compensation and benefits satisfaction, senior management satisfaction, expectations for company outlook, and the number of employers hiring per city. 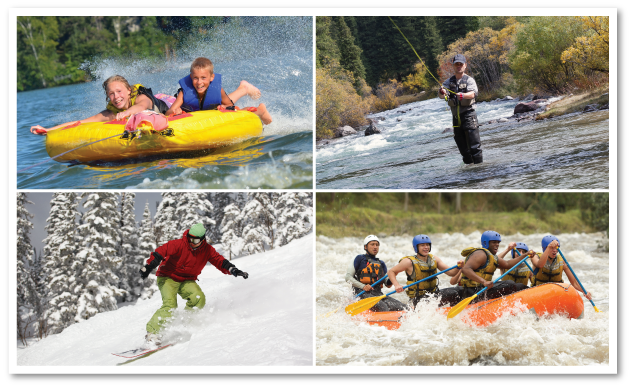 From water sports to fly fishing or snow skiing, it’s only a short drive from Salida. The Salida facility was built in 1968 as a receiving station for freshly harvested almonds. By 1984 it grew into the largest receiving station in the world and can now receive millions of pounds of almonds each day. Safe, under-roof storage accommodates more than 100 million pounds at any given time. In 1979 the plant was upgraded from simply almond storage to include a brown almond processing line and by 2007 in became the most technologically advanced brown almond processing line in the world. The facility encompasses 49 acres and can process over 1 million pounds of almonds every day. Salida is an easy, three-mile commute from the friendly city of Modesto in the heart of the booming agricultural San Joaquin Valley. The Gallo Center for the Arts attracts renowned performers, offering a rich cultural environment surrounded by beautiful orchards, dairy farms, and vineyards. From farmers’ markets to museums, there’s plenty to do year-round for its 200,000 residents. Modesto is also the birthplace of filmmaker George Lucas and home to the Historic Graffiti Cruise Route! 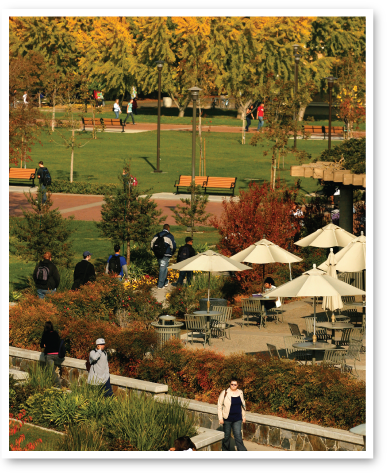 California State University Stanislaus is an exceptional public university offering undergraduate and graduate degrees to a highly diverse student body. In 2013, we also celebrated the opening of a new 200,000-square-foot manufacturing plant on 88 acres in Turlock, California, significantly enhancing our capacity. The three-phased project will eventually yield a total of 500,000 square feet and many more job opportunities. New principles of project design and delivery, and cutting-edge technology have vastly increased our production rate. This new facility represents the largest single investment in the almond industry since 1910, when the Blue Diamond Cooperative organized and created the world’s most recognized almond brand. In April 2014, this state-of-the-art Turlock facility was named the 2014 “Plant of the Year” by Food Engineering Magazine. Click here to view the article. Located just 14 miles from Modesto in the heart of California’s Central Valley, Turlock is the second largest city in Stanislaus County with a population of more than 69,000. The presence of California State University Stanislaus makes Turlock an educated college town with a casual rural lifestyle. Add to that a lively arts and cultural scene, frequent athletic events, 24 parks, and 16 good schools. The nearby Gold Country, San Francisco Bay Area, and the Sierra Nevada allow residents plenty of opportunities for weekend relaxation.